Jobs in microbiology focus on the study of microorganisms and their impact on society. Microorganisms are tiny life forms found just about everywhere. Examples include bacteria, fungi and parasites. Some of these organisms are helpful, while others are harmful; for example, harmful microbes are disease-causing pathogens that create adverse health effects. Many microbiology jobs revolve around research, testing and analysis of both harmful and helpful microorganisms for many reasons, including disease prevention. Definitive job objectives depend on the microbiology career path. Choices include the study of microbial impact or applications in medicine, the environment and foods. If you want to focus your microbiology knowledge on the study of bacteria, an example of a job objective will be to work in a laboratory environment to study the characteristics of bacteria. You will use your diagnostic skills and expertise to investigate and understand harmful and helpful effects of microorganisms. For instance, you may want to investigate how strains of bacteria contribute to illnesses in humans or animals. Microbes are essentially everywhere, including land, water and air. If you want to use your microbiology education to support the environment, job objectives may include studying microbes to determine effects on the environment, including those that may contaminate water sources or cause other pollution issues. You will use your skills and knowledge to conduct tests to detect the presence of these harmful microbes. Food safety is paramount to human health and welfare. Pathogens can invade food due to improper handling, storage and preparation. Food microbiology job objectives include studying these microorganisms that cause spoilage to understand how to inhibit the growth and improve food safety. Another job objective is the study of helpful bacterial microbes, such as probiotics, and how they relate to food science. 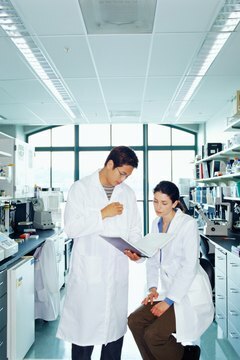 The focus of microbiology jobs in medical research is developing and advancing health related products. A microbiology job description includes using your background to contribute to the development of new medicines or medical treatments in a laboratory environment. You will use your skills and knowledge for the fight against infectious diseases. Your work could lead to new or improved vaccines or antibiotics. 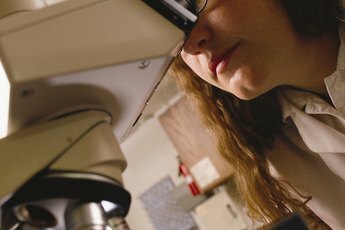 Pathology-related microbiology focuses on diagnosing diseases caused by microorganisms. A job description includes using your skills and knowledge to perform diagnostic testing and analysis. You will use your clinical or laboratory expertise to identify types of disease causing bacteria, fungus, parasites or other microbial pathogens found in test specimens. Pathology diagnostics cover many routine and specialized testing protocols. Many microbiology jobs require a minimum of a bachelor’s degree in microbiology or a closely related science like biology. If you have an advanced degree, you can focus your job objective primarily on research. An objective could be to use your education and knowledge to study and develop improved medical treatments for chronic illnesses. Another educational research objective is to use your knowledge and expertise to develop alternative fuel and energy sources.